PER MERTESACKER has delivered an insight into the Arsenal dressing room following Arsene Wenger’s announcement. Wenger confirmed this morning that he would leave Arsenal in the summer following near 22 years at the club. 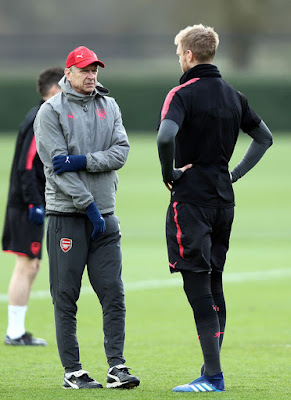 Wenger is believed to have told the players just before the statement went out and there was a sense of shock at the training ground. And Mertesacker is the first player to open up on the situation. "We have just been informed basically,” he said. “It is quite emotional. Obviously he has been at the club for such a long time, he has been so supportive to me. One major reason why I’m here is because of him. “It’s been emotional and there will be time to digest it but it is a sad feeling right now. "He’s been the major figure for this club for over 20 years. He’s been so impressive for me and he’s trusted me so much throughout my career, in bringing me here, giving me the opportunity to play here and making me captain even when I was injured. "He also gave me a future role here at the club, so I’m very grateful and humbled for the opportunity he gave to me. “It is a sad day for me but we’re also moving forward for the future. It’s in Arsène’s interest as well that this club will give positive memories to the fans and the people." Wenger announced he was standing down this morning in a post on the club website. “After careful consideration and following discussions with the club, I feel it is the right time for me to step down at the end of the season," he said.